Every mission to space is an extreme endeavor with new approaches being tested under the most severe conditions. Now it is time for these principles to return to Earth—to inspire and to accelerate the development of the architecture discipline. David Pasek’s interview with space architect David Nixon and a brief history of architecture in space give a unique perspective on the great architectural challenges in orbit and beyond. Spaceflight was developed in a long sequence of trial and error with many technological disappointments. Once the technical solution seemed functional it was then tested with animals, and human pioneers followed shortly thereafter in tiny capsules enduring for hours rather than days. At this point, these endeavors were still very experimental and highly risky. Also—at that stage no architects were needed. But at the end of the 1960’s, time spent in space grew for the crews, and space capsules began to be regarded as space-habitats. Architects were then asked to design the interiors and to think about the basic needs of astronauts in those extreme conditions. Analyzing those conditions, the result was a long list of parameters that needed to accommodate hardworking and focused people with strong personalities, in tiny spaces, under the condition of microgravity, and for long periods of time. All elements had to be highly scrutinized, as any failure would endanger the mission as a whole. One also had to consider also all the ground facilities that were needed, such as test, training, and development buildings, but also include communication, launch, and return structures. The International Space Station (ISS) is the first considerable architecture in space, but David Nixon says it is a pity the crew lacks a suitable habitation unit. Although the planning was completed, it could not be realized due to budget issues. As the most expensive object that humankind has ever financed, the ISS has a fascinating history, about which Nixon is preparing a book. 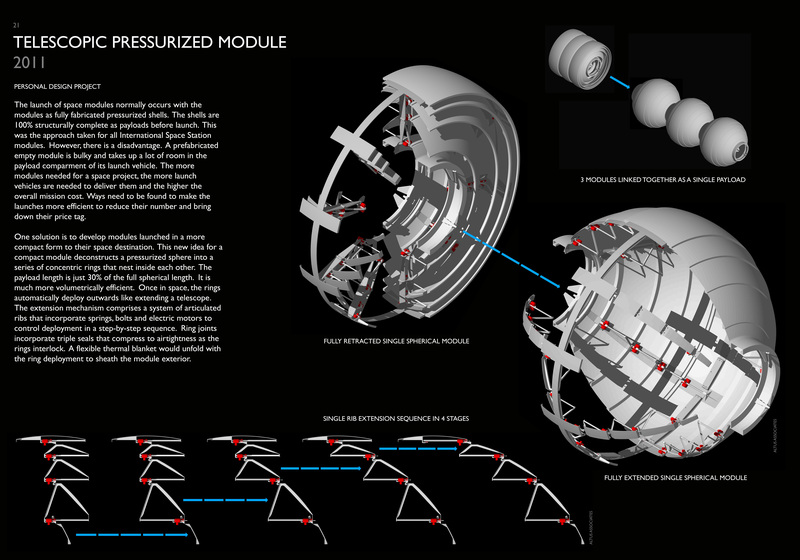 With his technical background, Nixon is also strategizing to extend the life span of the existing modules in orbit and discusses the best way to renovate them. In the late 1970’s architects David Nixon and Jan Kaplicky founded their office Future Systems in London and began to implement the approach of “high-tech” in all aspects of architecture—not just on the surface of the facade. They understood their studio as a laboratory for a transfer of technology and ideas and against dullness taking over architecture. Their first projects had titles like “cockpit” or “cabin” and were developed without a client. These concepts were based on the construction principles of cars and airplanes and were meant as self-sufficient units for life in nature. At the beginning of the 1980’s David Nixon moved to California to teach architecture at the University of California in Los Angeles. 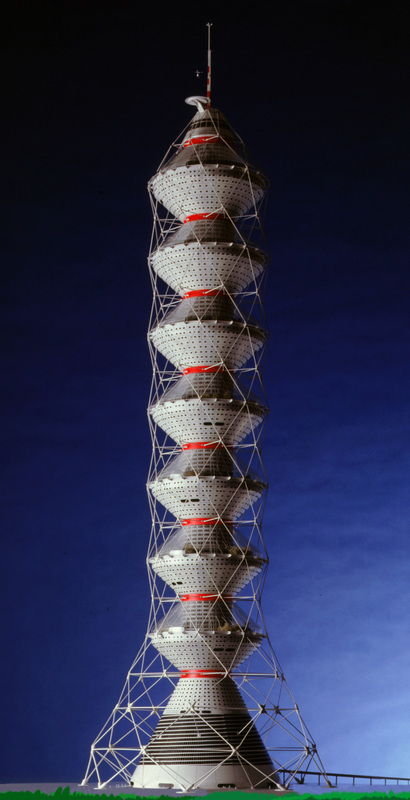 By chance he came in contact with NASA, and Future Systems was the first architectural studio based outside the United States to be commissioned with a research contract. 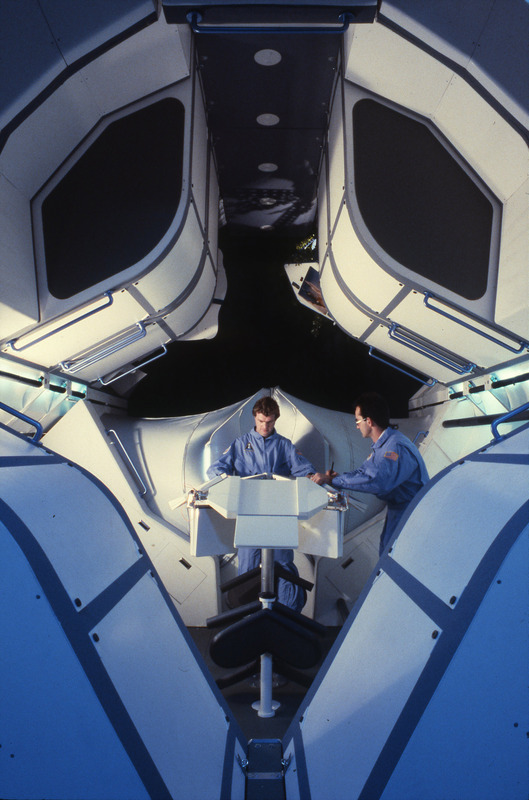 The research task for Future Systems was to develop a habitation module for a forerunner of the International Space Station (ISS)—the Skylab. It was planned to offer six fan-shaped private compartments. The walls could be folded on top of each other, providing each compartment more space when fewer people were using the facility. 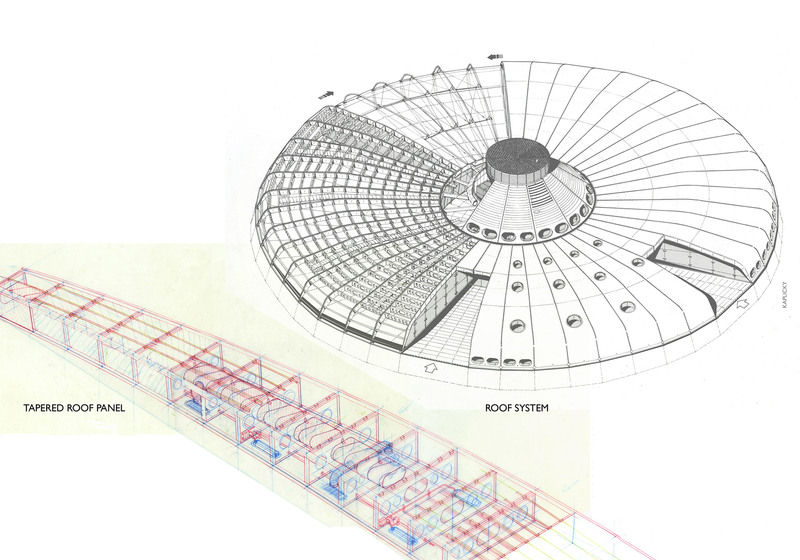 The middle of the structure was projected as a tunnel, so users could walk through the module. 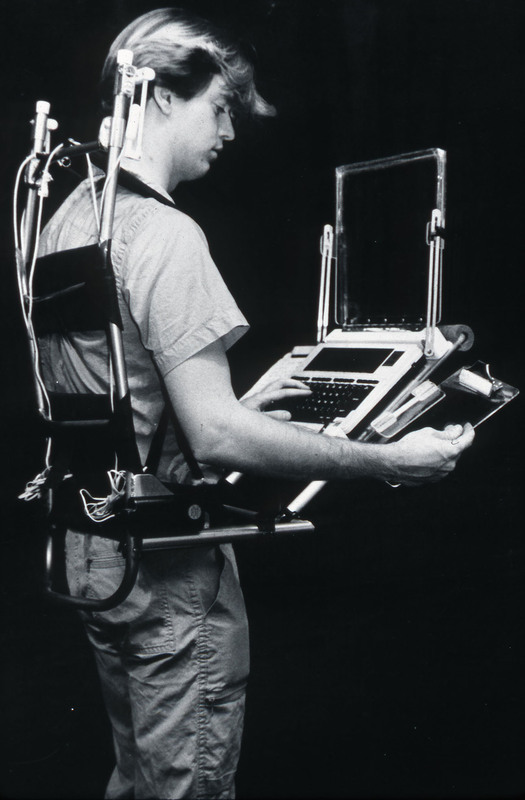 Based on Nixon and Kaplicky’s research regarding human bodies in microgravity, they developed a folding table that was suitable to fulfill the everyday needs of astronauts. The human body takes a different position when not exposed to gravity, and therefore, the two architects also designed a lounger for relaxation. Both designs were taken forward and passed the flight security procedure testing, but they were canceled because of budget constraints. A designer working on space projects has to be able to cope with frustration and disappointments as even fewer projects are realized than in the Earth-bound field. Another project could have dramatically changed the way structures are assembled in space, though it may not seem spectacular at first glance. 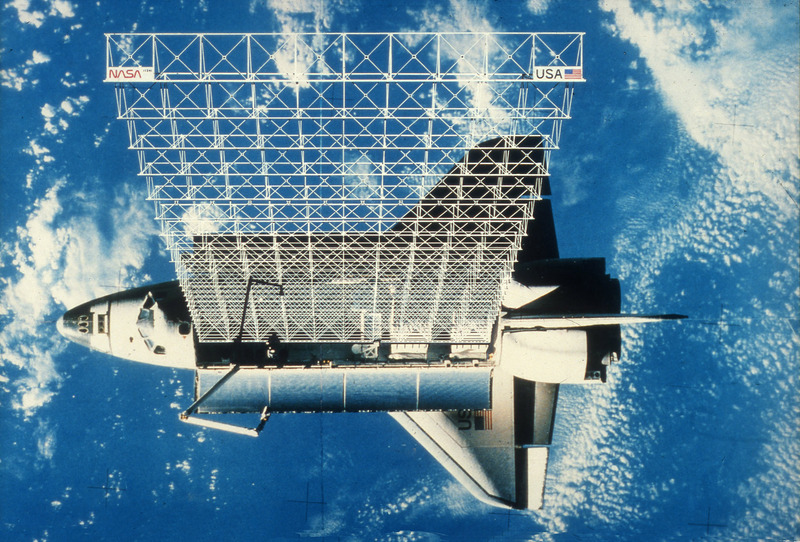 Future Systems developed a self-folding backbone beam that held all the elements together, such as solar panels, laboratories, and habitation units. This special type of beam was designed to be small and light for the launch into orbit and with no risky space walks needed to assemble it. The ISS was built in the classic manner—voluminous prefabricated elements were transported to space with the result that more freight-and-weight volume in the space shuttles was used than would be necessary. Project by project, the two partners transferred their ideas into the field of architecture, but the collaboration process got more and more difficult, like chess—every design proposal had to be sent over the ocean and then back again. 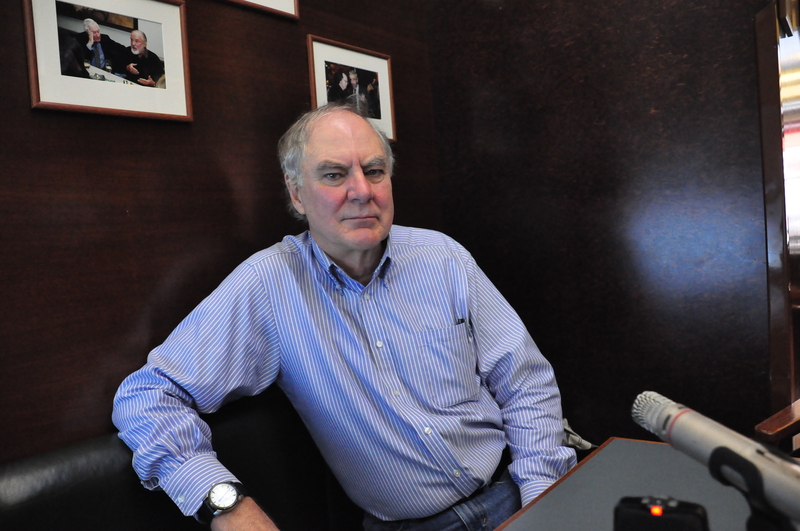 Unlike Jan Kaplicky, David Nixon lost his interest in terrestrial projects and founded a company in California that specialized in space architecture. The end of the space-shuttle program and restrictive legislation of the US government after September 11, 2001 changed the circumstances for the whole space-industry. The priorities for the scheduled flights of the shuttles were altered, and private initiatives and companies no longer had access to transport their products to space. The new laws also restricted the export of space-technologies from the United States. So Nixon decided to relocate and founded a new company in Ireland called Astrocourier, supported by government tax incentives. The aim of Astrocourier is to enable students and small companies to bring their own micro-experiments into space. The size of these experiments will be each about the size of a mobile phone. Like the whole space-industry, this company waits for a new generation of spacecraft with more efficient engines. Interview with David Nixon, space architect, at the opening of his exhibition “Thresholds of Space” at the National Library of Technology, Prague held in November/December 2013. The interview was broadcast in December 2013 on A Palaver—Architecture radio—a project of David Pasek & Bernhard Frodl. “Terrestrial architecture must learn from extra-terrestrial architecture” says David Nixon, “as today’s architecture consumes pure products and leaves waste.” In space this is impossible as resources are very limited and must be always recycled and reused. Nixon reminds today’s architects to concentrate on the basic human needs; for example, on housing concepts that could be erected in disaster areas within hours. 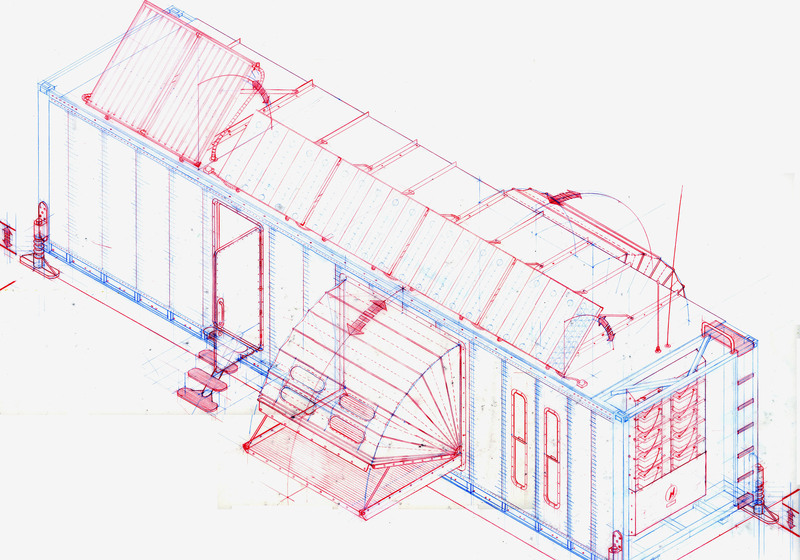 He also dislikes architecture that reduces the task to formal questions, and he reminds students to practice drawing by hand as basic and quick tools of architecture. David Pasek: As far as I understand it, you were trained as a standard architect, and you basically invented being a space architect. David Nixon: The term space architect has its origins in the early 1980’s when the International Space Station began as a project. NASA [and] American aerospace contractors began to hire a few architects to help design the interiors of the modules, and the term space architect was born at that time. Yes, indeed I trained as a conventional architect and began to get involved in the space field at that time in the early 1980’s. It was a matter of learning as you go; you had to pick up the technical background information and become competent in a lot of engineering issues that you would not normally come into contact with designing a building on the ground, on Earth. 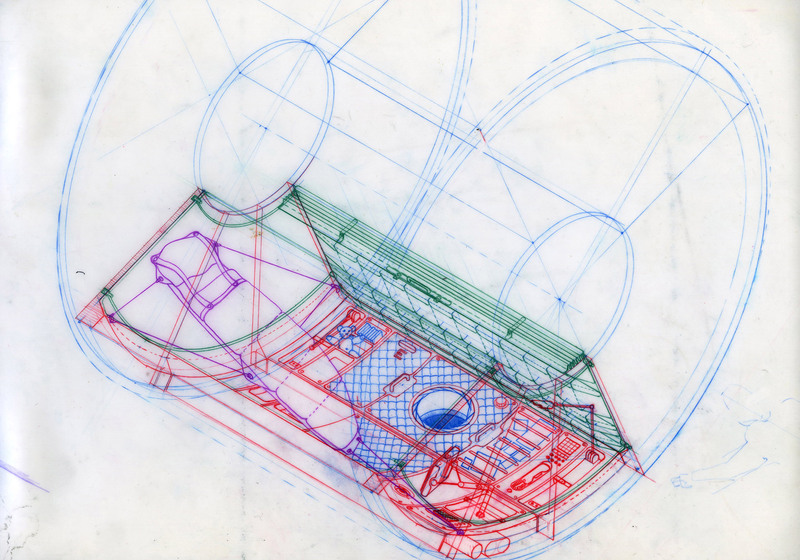 There was a learning cycle to go through of several years, and I think by the time of the late 1980’s I had gotten to the point that I felt fairly confident with my abilities in that aspect of space architecture, dealing with the design of accommodations and side modules and capsules. When I set up my own office in 1992 in Los Angles, of course I got involved in a completely different field, which was what they called launch infrastructure—planning and designing of launch facilities—and so, that again was a another new area that I had to learn about. When you design something in the context of NASA, the teams and the structure of teams are very different. What is the role of an architect within such a team? Nixon: At the time that space architects began to get involved the role was really minimal. They (architects) were used as people who could draw, people who could maybe choose colors for the walls, a very basic level of input without much respect on the part of engineers. It’s been a battle since the 1980’s up to the present time, to establish the space architecture field as a semi professional field or a field of expert knowledge in its own right. But I think it’s fair to say now, today, we are a recognized group throughout the aerospace field in America and beyond. We are brought in at the beginning of projects to help produce the concept work, and engineers are now listening to what we have to say. It’s taken us 30 years to get to that point, and I suppose there are now 30 space architects around the world of which maybe 10 are actively earning a living from the field, and the rest are staring at the heavens and hoping. It’s a very unpredictable field. There is very little work in it at the moment. It’s a cyclical thing where you come to the end of a major project, government funding falls off, there are no more opportunities, then you have to wait until the next cycle upturn, and that is what we are waiting for now. I was wondering about the continuity of a project; many projects were developed at quite a high standard, already finished, and then the program gets canceled as a whole, and the object that was designed doesn’t get used. It seems to be very inefficient. Isn’t there enough communication to use all the knowledge? Nixon: We took the table project (for example) to what they call the advanced prototype stage, and in the aerospace language field that means the point at which you’ve validated and tested the hardware in the terrestrial environment before you develop the flight hardware. That’s because flight hardware has to be approved, checked and verified, and inspected to make sure its absolutely safe before it is sent up to orbit. Because if something goes wrong with it you can’t repair it really, or it’s very difficult to repair. What happened was that the habitation module in which the crew was going to live on the space station project was canceled. It was set aside first in the late 1980’s to 1990, as part of the station, and fully canceled several years later. 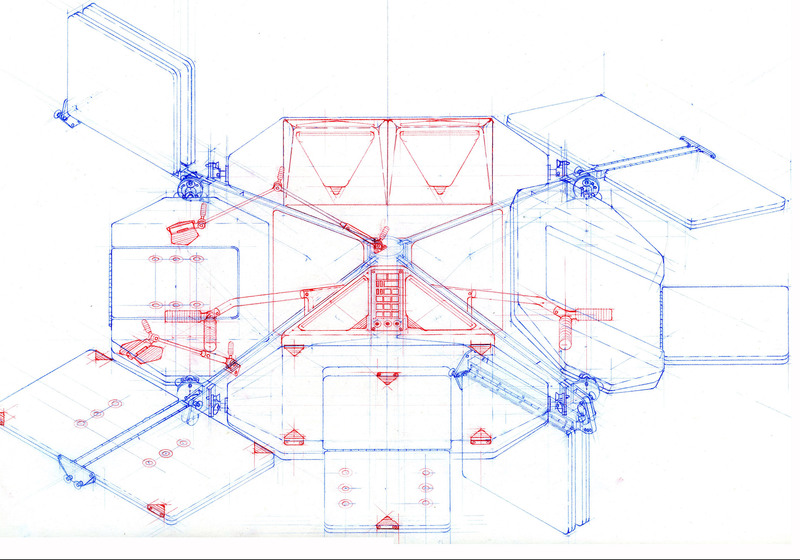 So further work on designing the interior of the habitation module stopped in about 1990, and it wasn’t possible to take the table design forward or any of the other equipment items that were going to be installed in the module. And that remains the case today, that there is no proper living module on the station despite the fact that it cost $150 billion American dollars to construct. Today astronauts have to make due with facilities that are less than what one would expect of such an expensive facility. That’s all due to the problems of the cost escalations and the need to cut back the costs from the late 1980’s, all the way through until the first building block was launched in 1998. The analogy in the building industry is really such that if you design and build a skyscraper, for example, and you spend too much money on the foundations and the structure, right at the end of the job there isn’t enough for the restrooms, the lavatories and the elevators, so you have to walk all the way up. That is really how it ended up on the station—that the internal facilities were less than satisfactory. Now, that doesn’t mean to say that the situation may not change; because the space station is going to continue until at least 2020 and probably until 2028. There are opportunities for upgrading some of the module interiors, and there are also opportunities of adding further modules. The Russian are going to be adding, I think, one or two further research modules next year or the year after. So it is still very much a project in progress. The question is now [about] what the future holds in terms of its perceived potential to carry out research—the scientific research for which it was designed in the first place—and whether an opportunity exists to improve the quality of the living environment alongside the need to expand the research. In the exhibition there is a panel noting a forthcoming book on the space station. Did you write this book, and what can we expect from it? Nixon: I became fascinated with this project since it was the project that got Jan [Kaplicky] and me involved in space in the first place back in the 1980’s. And nobody had written a book on it. There was no well-documented history that chronicled its story from beginning to end, particularly with a view to its design origins, and all the design changes and engineering additions. So, five years ago I decided I’d write a book, mainly full of photographs and drawings, which I thought would be appealing to the general public. As I got into the project I became fascinated by the background story, particularly the political and the technical engineering aspect, [so] the book has evolved into a chronicle of the story of the station from 1979 up to its completion a couple of years ago. It involved a lot of background research into old documents and reports, which I have gone through and extracted information to put into the story. Can you explain the basic idea of micro-experiments that go up into space? Nixon: I’m very keen on trying to encourage access to space for business and the education community. I have found it hard in the past to fly experiments into space because of the cost and because of the complexity of the approval process. I set up a business, nothing to do with architecture, a business venture in space in the year 2000 called Astrocourier (Ltd.) with the aim of developing miniaturized services and experiments to open the market up to small business and schools—organizations like that—who would like to be able to send something up into space, maybe even a commercial product, and get it back after three or four days in orbit. That service did not exist at that time and still does not exist. First of all, up to the time the Space Shuttle was canceled it was the only vehicle on which it was possible to fly such experiments. And the going rates for sending commercial payloads, non-government payloads, experiments, up into space on the shuttle was about $25,000 American dollars per kilogram, which was very expensive and far beyond the means of small businesses, many universities, and schools. So we began to develop some micro-sized experiments about the size of mobile phones, weighing about between 100 and 200 grams that would be small enough and light enough to bring that cost down. We developed our first one, flew it and tested it through the European Space Agency (ESA) in 2007. What we are waiting for is a new vehicle, a launch vehicle spacecraft to appear on the horizon that will be able to fly our experiments on a regular basis at a much lower cost. And there are a couple of options on the market now. There are two vehicles in development in Europe, I’m pleased to say, one in Great Britain and the other through the ESA, that in a few years now may offer that much more affordable service into space. So we are sitting on the sidelines at the moment waiting to see what happens. Nixon: Architecture for me, when I started, was a designing of habitats on, or close to, the surface of the Earth. And now I have a slightly different view of it because I think there is a divergence, beginning with the advent and the appearance of space architecture. Architecture, in the future, is going to go off in two directions. You are going to have terrestrial architecture, which will continue much as it has done for hundreds of thousand of years, and you will have space architecture, involved in designing habitats in Earth orbit and beyond. I think as the centuries go by, you will find that space architecture will pass terrestrial architecture in importance. Because ultimately, in my view, in maybe a thousand years from now or less, we won’t need any more buildings on this planet because the population will have stabilized. It will have had to stabilize in order to survive. And an equilibrium will have been reached between the size of the population and the resources that can support it, on this planet, on Earth, because there is no other solution to the survival of the human species, except to take that course. Ultimately, it is what we have to do. The other thing is, I think buildings will not be needed anymore. By that time (in the future), buildings will be built out of extremely strong durable materials that will last hundreds of thousands of years. We shall have, more or less, built all the buildings we need if the population stabilizes. And the quality of those buildings will be extraordinary. They will be intelligent buildings built by robots. In fact, the buildings will be thinking feeling machines themselves. I don’t see that there will be much need for more of them, and it may be that we’ll have had enough of them in a few hundred years from now. All the action will be in Earth orbit and beyond, because by then we will have branched out into building colonies and settlements on the Moon, and Mars, and on other plants across the solar system. All the action, in terms of architecture, will be out there, and it will be space architecture that is adjusted to the gravitational and physical environments of the planets and moons concerned. All of which are different. Architecture will metamorphose into many directions, depending on the environment in which it occurs. And well, I certainly won’t be around to see it, but I do hope that architects of the future will be able to do that, and to me that is a fascinating thought. Portions of this article were translated from QUER magazine. And find more conversations, concepts, stories, desires and dreams in the field of architecture on www.apalaver.com.